You care about how you invest your time. You’re trying hard to maximize your potential. Some days you feel like a “rock star.” Other days, not so much. Too often, you simply feel exhausted. So many people depend on you. Life’s demands are relentless. There’s no time to rest. Despite your best efforts, your “to do” list grows faster than you can possibly cross things off. Life feels crazy and chaotic … like things are spinning out of control. But you’re not content with the chaos. You’re reaching for something better. I’ve been researching productivity and time management since I was a teenager. One of the first resources I encountered was Stephen Covey’s classic book, The Seven Habits of Highly Effective People. Although I read it many years ago, it contains insight and practical advice that I’m still applying today. In his second habit, Covey urges us to “begin with the end in mind.” He asks us to imagine we are attending our own funeral. What do we want people to say about us? Covey challenges us to ponder our legacy. What changes do we need to make today to impact what people will say about us tomorrow? How do we want to be remembered? There is great value in the exercise Covey proposes, but I’d suggest one significant change. Rather than consider what others will say about us once we leave this earth, perhaps we might consider what the One who created us and dearly loves us will say to us once we stand before Him. Imagining that day might feel overwhelming. The same might be true of the funeral exercise. But, as a person seeking growth, you’re willing to risk thinking deeply about your life. Whether your goal is to live the best life you can in this world, or in the one yet to come, each post in this series will end with a challenge to help you succeed. You are striving to make the best investment of your time and talents. I respect that. You seek to maximize your unique potential. Your determination sets you apart from the crowd. Keep reaching! Keep pursuing the best and the true, and, most assuredly, you will impact the world in beautiful and startling ways. 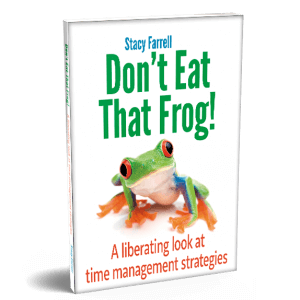 This is the introduction to a blog series based upon the book, Don't Eat That Frog! A Liberating Look at Time Management Strategies. So thrilled about your new book, Stacy! It’s so encouraging to know an author who is open to go anywhere God leads. Press on! Thanks, Vicki. You are a great encourager. Blessings on your writing journey!